Remember the times when you would go on your Facebook news feed and see every post from each person on your friend list? Some posts you cared about whereas most posts you didn’t care about at all. What about now, is this how your news feed on Facebook or other social media platforms looks like at present times? Knowing a thing or two about algorithms, we will make a not-so-lucky guess and say that it doesn’t. In fact, you see only the most popular posts, or the most relevant and engaging ones, as well as the ones you’re most likely to care about. But how does Facebook and other social media platforms know what posts would be most interesting to you so you’re most likely to like, comment, and share them? Welcome to the world of algorithms. As a social media marketer you should know what algorithms are and how to keep up with the many algorithm changes on different social media platforms. These algorithms may be good for social media users, but for social media marketers it’s quite the opposite due to their complexity as well as the constant, rapid changes. This is the best place online for you to inform yourself on this topic, so if you want to stay on track with the newest algorithm changes, we encourage you to read on. So, What Exactly are Social Media Algorithms? To put it in the simplest possible terms, social media algorithms are a way of arranging statuses/tweets/photos/videos that appear on a certain social media platform’s feed, based not on the time when they were published, but on their relevancy and engagement instead. This means that the posts on the users’ news feed do not appear in chronological order, but many other factors come into play instead. In other words, different platforms have different rules when it comes to picking and choosing the posts which appear on the users’ feed, most common ones being the popularity of the post and your previous engagement with the person or the page who posted them as well as your engagement with similar content. By showing users what they’ll most likely want to see, social media platforms make them stay on their sites for longer and make them want to return for more. Prioritizing the content through algorithms is exactly why it’s so hard to stop scrolling down your Facebook, Instagram, or Twitter feed and why you are drawn to come back for more. So, as a social media marketer, how can you use this to the best of your abilities in order for your content to appear on most of your followers’ feeds? One thing is for sure, you have to stay on track with all social media changes, especially their ever-changing algorithms if you want to make it as an entrepreneur or a social media marketer in 2018. So, let’s see how you can do this and keep up with the pace of change. Being an entrepreneur or a business owner who uses social media platforms, your brand is at the mercy of their constantly changing algorithms. In order to promote the brand to the best of your abilities, whether you’re the owner or the marketer, you have to stay on track and keep up with the constant algorithmic changes. One way to do this is to visit conferences, and meet people from your industry. This way, not only will you make connections that will surely benefit your business, but you’ll also be able to receive the latest news regarding social media changes, including their algorithms. Another way is to use Google Alerts. This hidden gem is a notification service that will keep you updated on the latest news of your choosing, and we don’t have to mention that is extremely useful when it comes to staying on track with the newest social media algorithm changes. Simply insert your keywords, and you will receive the latest news regarding social media algorithm changes on your email each time a new article regarding this topic appears on Google. Brand24 is another monitoring tool which works in a similar manner like Google Alerts, and there are a few more which you can use as its alternative, so you can try a couple and see which one delivers the news the fastest and in most reliable manner. Lastly, read the latest articles on this topic. In order to adapt to these changes, you need to be aware of what those changes are, so inform yourself as much as you can, and reading this article is a great way to do so. The minute you figure one social media platforms’ algorithm changes, they change again. This is a never-ending loop, and since each platform uses different algorithms to organize their posts, we made the job of staying on track with the latest changes easier for you, at least for the year 2018. So, here are the latest updates on the top three social media platforms’ algorithms, Facebook, Instagram, and Twitter, and all the changes they endured toward the end of 2017, so that you are ready for 2018. Facebook has been using algorithms since the appearance of their news feed. The goal of the algorithm, according to them, is to show the right content to the right people at the perfect moment so they don’t miss content they actually care about. This sounds good for the everyday user, since no one wants to see irrelevant content and posts they care nothing about on their news feed, however, for businesses is a totally different story. This algorithm makes it harder for businesses to reach as many people as they would before its existence, so let’s take a look at Facebook algorithm’s core values and see what kind of content it prefers. Sign up to Amplifr and connect your Facebook profiles and Pages to manage them effectively and hassle-free. Friends and Family Always Come First — sorry to disappoint you, but your followers will always see their friends’ and family’s posts before those of your business. This was, is, and will always be the main principle of the Facebook’s algorithm, which is connecting its users primarily with their friends and family and placing those posts towards the top of the News Feed. Posts that Inform are Prioritized — each person finds different posts to be informative to them personally, whether those posts include political news, news from the entertainment world, recipes, and so on. Facebook’s algorithm always tries to figure out what each user finds what post to be informative, and ranks those posts higher in their news feed. Therefore, in order to increase the engagement of your posts, try to work out what your target audience finds informative and include that type of information on your Facebook page’s wall. Posts that Entertain are Prioritized — again, different people find different type of content entertaining and it’s the algorithm’s job to work this out and prioritize accordingly. Humor and content that entertains always works and it has a high chance of going viral, so incorporate some humorous video/post/tweet/photo in your feed both relevant to your business and according to the preferences of your target audience and evaluate their reaction. Authentic Posts are Prioritized — Facebook prefers authentic content over spammy and misleading one, so make sure your posts are genuine if you want them to be present in your follower’s News Feeds. What are the Latest Facebook Algorithm Changes? Say goodbye to sensational headlines as Facebook has waged a war on clickbait posts in 2017, otherwise known as engagement bait posts. Spam-like messages and titles and other posts that are used in order for reach to be gained artificially instead of authentically won’t be shown on Facebook’s News Feed as often as before, so keep this in mind next time you post on your page. Titles such as “Eating a Banana Every Morning Will Do the Following Wonders for Your Body, Guaranteed” or “She Drank This for a Week and You Won’t Believe What Happened Next” will be recognized by the updated algorithm and won’t be shown as often as before on the News Feed, the former being posts that exaggerate information while the latter posts that withhold information. Also, imploring users to like, share, or comment on certain posts will also be discouraged by the new algorithm as Facebook targets individual posts and this type of headlines will make these posts more recognizable. Being one of the core Facebook values further updated in 2017, the Facebook algorithm will push forward links that are genuinely informative rather than links that misinform and sensationalist headlines. This tends to discourage frequent sharers of problematic links, so make sure that your links have meaningful headlines and inform your target audience on what they care the most. One of the newest Facebook algorithm updates takes into consideration how fast a site loads after users click on it from their mobile phones. The users’ network connection and the speed of the website in question will be taken into account, so if one site loads in a quicker manner than another, that site will be ranked higher in the user’s News Feed. This specifically benefits instant articles, but clicking on those does not drive users to your website. So, in order for your posts to be ranked as highly as possible in your followers’ News Feed, make sure that your website is fast and more importantly, mobile-friendly. There are ways in which you can improve your mobile site load time, so make sure to give your users the best mobile experience if you want your posts to be more visible. Have you ever clicked on a post that looked like a video but actually redirected you to a certain website? Those still images with a fake “play” button on them that trick people into thinking they are clicking on an actual video are known as video clickbait, and Facebook updated their algorithm in 2017 that limits the appearance of these kinds of posts. Since Facebook promotes and prefers video content, some publishers have found a way to trick its algorithm, but you better know that this will be no more. Facebook has figured this out and the new update will be demoting these fake videos, so make sure that your content is genuine and avoid relying on such practices. How to Outwit the Facebook Algorithm and Increase Engagement? Gaining exposure on Facebook becomes more difficult with each passing day. Organic reach has dropped when Facebook adjusted its algorithm to prioritize content from the user’s friends and family, and continues to drop as each new page is being created. Changing and updating its algorithm hasn’t helped. On the contrary, this resulted in even less reach for organic posts, so how do you go about this? Since there is too much content on Facebook nowadays, you’ve got to stand out and try to outwit its algorithm in order to increase engagement of your posts, and you can do that by doing the following things. As we already mentioned, Facebook prefers and supports videos on their News Feed as videos have the most engagement than any other type of Facebook posts. In terms of engagement, square videos rank much higher than landscape videos, so have this in mind when you create your next one. Also, since most people watch them without turning on the sound, make sure to put captions in order for your followers not to move on to the next post on their News Feed. Use an eye-catching, custom thumbnail, and if you want even more visibility, post the video natively on Facebook instead of posting a YouTube link as they preform way better. Add a descriptive title, add a couple of tags, and you’re set. No, we don’t mean for you to nag your followers into liking, sharing, and commenting on your content, but to get creative with this instead. For example, if your post includes a video from a beautiful island, you can say something along the lines of “tag a friend that would love to be here with you right now”, or if you share a photo with an inspirational or motivational message, you can say something like “share this with someone who needs to hear this today”, and so on, you get the gist. This way, your followers will not feel pressured into commenting or sharing your posts, but will do that voluntarily instead. As organic reach is in its decline, eventually arriving at zero, sooner or later you’ll have to use the power of paid ads in order for your posts to gain more reach. Another way to do this is to boost a post that already preforms well which will lead it to a better performance and a higher reach. Instagram is known to be the biggest photo-sharing platform of today, and for the first six years its posts, which now also include videos, were shown on its feed chronologically. In other words, Instagram users were seeing the most recently posted photos and videos first, regardless of who posted them and what the posts actually were. Six years after its birth, or more specifically in 2016, Instagram has changed this and incorporated an algorithm that works similarly as the one Facebook uses. Needless to say, Instagram users were so mad that the petition they started gained 70.000 signatures in the first 24 hours. Regardless, Instagram continued with the implementation of their algorithm and in order for you to understand how it works, here are some key factors it considers the most. Engagement — engagement means how engaging, or how popular a certain post is. When you share a post on Instagram, that post is shown to a sample audience so that the Instagram algorithm can see how that sample audience engages with the post. If the engagement is high and if the post receives many likes, comments, views, or shares, the algorithm will determine that the post is highly engaging and it will show it to even more people, meaning that the higher the engagement, the higher the ranking on the feed. In order to increase the engagement (therefore the visibility of your posts), connect your profiles to Amplifr to figure out the best time to post and utilize this knowledge to increase your reach. Relevancy — the genre of your post will most likely show to those who are interested in that particular genre and type of content. The Instagram algorithm may work in mysterious ways, but it does know who liked what, and what users engage with what type of posts the most. With photo recognition and relevant keywords and hashtags the Instagram algorithm can easily determine what post belongs to what genre and distribute that post accordingly to those most likely interested in it. Therefore, make sure that you know what your target audience is since that way you can more easily figure out what your followers are more likely to engage with. Relationships — similarly like Facebook, Instagram doesn’t want its users to miss their friends and family’s posts, which is why it shows those posts higher in their feed. But how does Instagram know which users are your family and friends? Well, this is determined based on your most frequent interaction with other users, since you are more likely to consistently like your sister’s or best friend’s photos and videos rather than some acquaintance you barely know. You can use this to your benefit by developing ongoing relationships and engaging more with your followers. See what posts perform best and create more similar content in order to increase the engagement of your posts and to give your fans what they like. Recentness — another thing the Instagram algorithm prefers is recent and relevant content. No matter their engagement, Instagram will more likely show you more recent posts rather than posts which are a few days or a few weeks old. This means that the best time to post would be when your followers are most active on the platform since this way your post would be more visible and higher ranked on their feed. Profile Searches — Instagram wants to improve its users’ experience, so another part of their algorithm is to track what each user searches for and give them what they want. For example, if a user often searches for travel-related posts on their profiles, next time they open their feed they will primarily see travel-related posts since Instagram has figured out that this type of content is what that particular user was looking for. This is why it’s very important for you to really know your target audience alongside their needs and wants, and provide that type of content to them since it will rank higher in their feed. Direct Shares — direct shares is one more thing the Instagram algorithm tracks in order to understand what its users want. Not only does the algorithm realize the type of content you prefer based on what you share the most, but it also looks at who you share that content with. The people you share those posts with are those you interact with the most, so the Instagram algorithm will most likely show you their posts more as well. Again, you can utilize this knowledge by knowing your target audience and the type of posts they share the most, so that you can produce that type of content for them in the future as well. 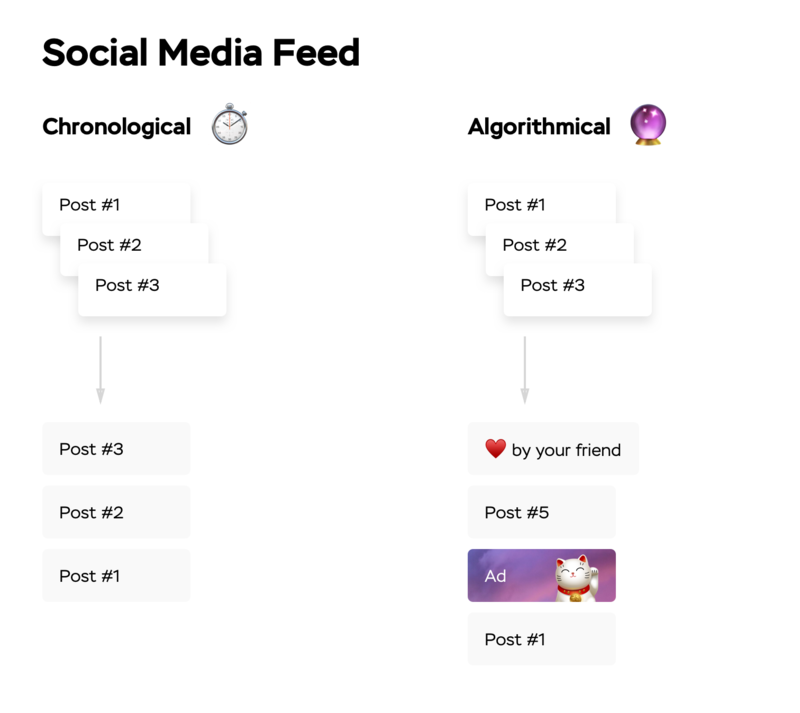 Time Spent on Posts — the time each user spends on different posts lets the Instagram algorithm know which posts are more relevant to them as opposed to others. They don’t even have to like on share them; the duration spent on viewing the post is an indicator enough for the algorithm to know the type of content the user prefers. Once again, knowing the preferences of your target audience will significantly help you to create more relevant and engaging content. How to Outwit the Instagram Algorithm and Increase Engagement? Since the Instagram algorithm is a fairly new thing, we’ve already mentioned all of its core values and the type of content it prefers. Instagram’s change from chronologic to algorithmic has made it difficult for some marketers to promote their content, so we’ll tell you some things you can do in order to increase the engagement of your posts and outwit the algorithm once and for all. Unoriginal content rarely works on any social media platform, Instagram included, so make sure that your content is unique and that you create an original voice for your brand. How does your post differ from the plethora of other posts on your followers’ feed? What makes your post unique and relevant to your target audience? How can you make your post even more original so it stands out from the crowd? These are all relevant questions you need to ask yourself if you want to be different from your competitors, therefore provide your followers with content they would like to share. The easiest way to do this would be to imagine that you are your buyer persona. Each time you create a post ask yourself if you would find this post interesting, and more importantly, if you would like, comment, or share it, and why. Getting into the shoes of your buyer persona will make it easier for you to understand your target audience and improve the quality of your content so it’s more engaging and relevant. It’s essential that you connect and engage with you audience, since after all, your followers are the ones that can make or break your business. You can make your brand more personable by replying to your followers’ comments. You can be certain that this will have a huge impact as they will more often comment and share your posts after feeling recognized and appreciated. Another way to do this is to post behind-the-scenes photos or videos from your company. How does your office desk look like? How does the production of your products go? What do your employers do in their free time? These are all things that will peak the interest of your followers and make your brand more personable and charming. Just like with Facebook, posting engaging captions will increase the comments on your posts which in turn will make them rank higher in your followers’ feed. If you post a photo from a spaghetti dish, you can ask your followers “What is your favorite pasta dish? Let us know in the comments and we’ll make it next week”, or if you post a photo from a captivating sunset you can add a caption like “What is your favorite place to watch the sunset from?” or something along those lines. No matter what you post, if you want the conversation to be ongoing, make sure to read and reply to your followers’ comments as this will only increase the engagement. People will most likely engage with current and fresh content, so use this tip if you want to increase the engagement of your posts. Classic movies, current holidays, popular TV shows, mainstream games and so many more trends are always available for you to use and incorporate in your posts. Choose those that are most relevant to your brand and to your target audience as well, and make sure that you don’t include politics, religion, or anything controversial that can divide your followers and arouse an argument. For example, if you have a baking channel, choose a current trend like the super-popular series Game of Thrones and create a cake according to a certain theme of the show. It can be a lemon cake since that particular flavor is Lady Sansa Stark’s favorite, or make it in the shape of some of the show’s houses’ sigils. The important thing is to be creative and unique, as this will make your post most likely to go viral, which is the ultimate social media success that you want. Since videos slowly but surely become the future of social media content, Instagram, just like Facebook, knows that this is what people want to see and promotes this type of content on their feed. Therefore, make use of video content by creating interesting and fun videos that will most likely be liked and shared by your target audience. You can film some pranks in your office thereby, as we already mentioned, making your brand more personable, or show your followers how your products are created. You can make a fun interview with your employers, even your customers, or film a fun moment during your office Christmas or Halloween party. Make sure that the videos are not longer than 60 seconds and add as many relevant hashtags as you can in order to increase your video’s reach. Not many marketers utilize the powers of Instagram stories, so jump on this trend until it’s still not very crowded. While some big names like L’Oreal Paris, Nike, and Starbucks quickly jumped on board of this trend, there is still some space that will allow for your brand to get more noticed, so don’t wait up. Instagram stories allow brands to provide more information about them, oftentimes in a fun and interactive way, while revealing their true personality by using not only filters, but also text, stickers, and even drawings. So, present that informal part of your business and try this powerful Instagram feature. Similarly to Instagram, Twitter only recently introduced their algorithm while showing their tweets chronologically up until that point. Their excuse was, just like with Facebook and Instagram, to show the right tweets, to the right people, at the right time. So, what are Twitter algorithm’s core values? Engagement — the Twitter algorithm knows which accounts you engage with the most, and shows you those tweets accordingly. Facebook and Instagram’s algorithms work in a similar manner, but Twitter also considers the engagement of your individual posts. According to this, those posts that receive the highest engagement are most likely to get boosted that those which don’t. Furthermore, if your tweet gets even more engaging and popular, the algorithm will prioritize it even more. Timing — after Twitter users rebelled against the new switch from chronological to algorithmic, Twitter has made sure that the chronological part is not going anywhere. Twitter’s own CEO has tweeted countless times that Twitter is live and real time, and that it’s users can always use the feature “while you were away” to see the newest tweets they might have missed while being away of the platform. Media Types — twitter prioritizes those media types that individual users find most interesting. For example, if your followers like and share your photos, in turn they will see more photos from you, if they like and share more of your videos, they will see more videos and so on. Twitter, like Facebook and Instagram, wants to give its users precisely what they want, so keep this in mind next time you post on this platform. How to outwit the Twitter algorithm and increase engagement? Again, like Instagram’s algorithm, Tweeter’s algorithm is also fairly new which is why there aren’t aby recent important updates that you need to be informed about apart from the ones that we just mentioned, so here are some tips to increase the engagement of your posts and outwit the Twitter algorithm. If you want to reach a broader audience, using relevant hashtags is a must. Not only do hashtags describe what your content is about, but they can also incorporate some humor into your tweet, even establish an emotional connection with your followers. Using trending hashtags will bring even more attention to your tweets, so do a search and see what’s trending on the platform. Connect your Twitter accounts to Amplifr to see which hashtags perform better and increase your social media performance. One difference between Instagram and Tweeter is that whereas on Instagram the more hashtags equals the better, on Twitter is quite the opposite. Therefore, use up to 3 hashtags in your posts and keep them short. Use easy to spell keywords and more memorable words, and who knows, maybe you’ll come up with the next trending hashtag on Twitter. According to some statistics, adding photos to tweets significantly increases the likes and shares they receive. Therefore, if you can send your message via picture, create so called “quote pictures” for maximum impact. There are so many free photo-editing tools online which you can use, such as BeFunky, Canva, or PicMonkey, so utilize this knowledge and diversify your posts. Memes and Gifs are a plus. Pin your best-performing tweets in order to boost this content even more. This will significantly boost the engagement of that particular post, and by being even more liked and shared it will draw new audience. Include a call-to-action and use this feature which works almost like a free advertisement on your profile. How Can Amplifr Help in Outwitting these Algorithms? Using a social media management tool like Amplifr can significantly help you to increase the engagement not only on Facebook, Instagram, and Twitter, but on many more social media platforms like LinkedIn, Google+, Pinterest, and Tumblr. As we said, posting at the right time is extremely important if you want your posts to be seen by as many of your followers as possible, but how do you know when your followers are most active? That’s one of Amplifr’s jobs, since this tool will tell you the best time slots for when to post your content based on your followers’ activity. Not only will it tell you the best times so that your posts gain higher reach, but it also allows you to schedule and reschedule posts on multiple accounts at the same time so you don’t have to do it individually every time. We also mentioned that knowing what your target audience needs and wants is essential for posting quality content that will peak their interest, and by using Amplifr you’ll also get this kind of data and insight by knowing what your followers like, click on, and share the most through post stats, daily stats, weekly reports, and monthly reports. This way you can be more aware of how your posts progress and increase their quality and with that their engagement. Optimize your accounts by keeping up with all the algorithm changes on social media. As there are only a few ways in which you can do this, we hope that by offering you the latest algorithm changes and tips on how to outwit Facebook’s, Instagram’s, and Twitter’s algorithms, you’ll be able to increase your engagement even more and acquire new followers. Algorithms can be pretty complex and they have shook things up in the social media world for sure, so make sure to always keep an eye out for new developments and changes. We here at Amplifr will strive to update you as best as possible.